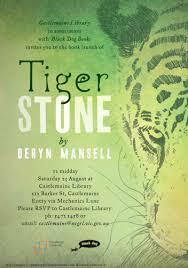 Today I helped author Deryn Mansell launch her first novel, Tiger Stone. It was a warm and happy occasion, held in the foyer of the Castlemaine Library, with a large contingent of Deryn’s family and friends there to help celebrate. Here’s the talk I gave. Deryn wrote Tiger Stone while studying Professional Writing and Editing at RMIT. She told me when we talked last week, that on freezing cold Central Goldfields mornings, catching the early train to Melbourne, she would go in her imagination to the steamy Javanese jungle of her story. Quite a feat of the imagination if you think of those frosts. Deryn knows Indonesia and Java in particular, very well. She’s been visiting there for over 25 years as a student and a teacher. She went to university in Jogjakarta, and has worked as a teacher of Indonesian in schools for many years. She now works with the Asia Education Foundation, furthering the role of Asian languages and cultures in Australian schools. 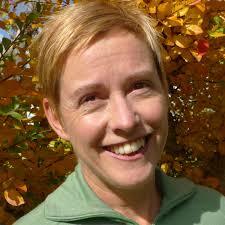 Until a few weeks ago, I didn’t know that Deryn and I lived in the same town. We’d both attended the same Walker/Black Dog Books conference in Sydney, but there were a lot of authors and illustrators present, and we didn’t meet on that day. However when Deryn walked into the Bookroom where I work, she recognised me – and asked if I would help launch Tiger Stone. Launching a first novel is a special and exciting experience, and I was flattered be asked. I hadn’t known anything much about Tiger Stone. I’d seen the cover at the conference, and I knew the book was set in Indonesia in the 14th century. A place and time I knew almost nothing about. 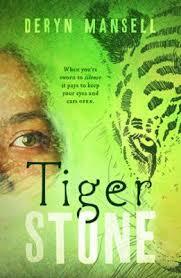 Then Tiger Stone arrived in the mail, and when I began to read it, I didn’t want to stop. It wasn’t just that it was a good, tricky mystery with two very engaging main characters. The pages were opening onto a time and place I knew nothing about…and that was exciting. You know that feeling when you go somewhere you’ve heard about but never been before? Say, a small town whose name you’ve seen on a map or a signpost. Well, you get there and lo and behold, there are people going about their lives, there are houses and buildings and landmarks and rocks and trees and a whole small world just going about its complex intertwined life… And now you know it exists and your world is enlarged. Reading can do the same sort of thing. I told Deryn this when we talked last week. I said that I thought reading Tiger Stone enlarged my world, and that it’s a great thing. It’s a gift. Growing up, I only learned about European history. Kings and Queens of England, the Wars of the Roses, the Battle of Waterloo, that kind of thing. Even though I’m an Australian, we didn’t do a lot of Australian history. A smattering of explorers was about it. The children’s novels I read were English or (a minority) Australian. The parts of the world geographically nearest me – South East Asia – were not even on my radar. I did learn Indonesian in high school, but our teacher was a Scot (I can still hear the accent) and we learned little or nothing about Indonesian history and culture. I wish I’d had a teacher like Deryn! I think that this book can be not only generally just a good read for children in years 5,6 and 7, but also a good addition to any Indonesian language or cultural studies. Having a sense of a long, rich, eventful, colourful vivid history stretching back in time would have made me a more enthusiastic Indonesian student, I’m sure. Deryn’s made Java in the time of Tiger Stone as full of drama as anything happening in Europe. Only no heavy velvet and fur, no suits of armour. The Battle of Bubat – in which the fictional Kancil’s father was killed – was a real event. Two Royal families – the Majapahit and the Sunda – were supposed to be united by marriage, but on their way to the wedding, the Sunda royal family were ambushed and killed. A bit like Game of Thrones? That violent past forms the background to Kancil’s story…and I’m not going to give too much more of the plot away, except to say that it’s a cracking mystery. The great thing about fiction, I argue, is that you can enter, imaginatively, right inside someone else’s world. Their thoughts, feelings, memories, observations. Through Deryn’s heroine Kancil I could hear and see and smell an existence I’d never even bothered to think about before. 14th century Java. A refugee, hiding her true identity because of hostility and mistrust. A lowly kitchen girl, a poor relation, living on charity in a rich uncle’s house in a village. Scorned and mistreated by the other servants. Lonely and isolated. Trying to care for her grieving and sick mother. Learning who to trust; making friends with a surprising ally. Reading Kancil’s tale, I got to exercise those muscles of imagination and sympathy. Essential muscles, I think. Without them we can think that ours is the only reality.